I am a NPR freak. I have a long commute and listen regularly to the new. I heard on the radio today that Thursday should have record breaking weather in SF, above 90 Degrees in the city and on our beaches! Just after that they reported on how the ice packs are at 50% capacity thus mandatory rationing will likely be needed in the East bay shortly followed by a summary of a speech John McCain gave in Portland on “human-caused climate change” his plan for a mandatory cap and trade system of carbon emissions. When the Republican presidential nominee seriously talks about carbon emissions, one has to admit it really is time to do something. Now I don’t really believe that weather or a hot day is a clear signs of climate change but it still has a visceral impact. The idea that beaches in SF could be as hot as 90 degrees in May is kind of shocking. 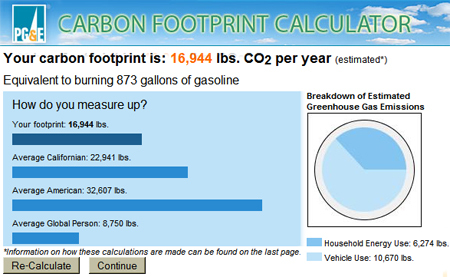 So I felt motivated to check out my household’s carbon footprint. I did it on several different sites (PG&E had the highest estimate) and they were all about 16 Tons/year for Karen and me (glad I traded in the sports car for a hybrid 2 years ago). Short of moving closer to work and changing my landlord’s appliances in my apartment, I can easily offset my household’s carbon emission for about $200/year. It sort of feels weird to just throw money at the issue but hey, if it means more trees are planted or old growth forests are funded and preserved, then who am I to argue with the free market economy. Categories: Green Living and Technology, Politics, Finance and News | Tags: carbon footprint, carbon offset, conservation, Global Warming, Green Living and Technology | Permalink.